High Five Kids Therapy provides Speech Language Therapy for kids with Speech and/or Language Disorders. A speech disorder refers to a problem with the actual production of sounds, whereas a language disorder refers to a difficulty understanding or putting words together to communicate ideas. 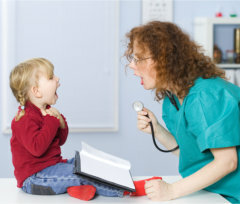 Speech Therapy focuses on the development of receptive and expressive language, articulation, feeding and swallowing skills, social communication and social skills in order for the child to be able to express their wants and needs. To inquire further about Speech Therapy at High Five Kids Therapy, please give us a call at 210-922-1785 or visit our clinic at 102 Palo Alto Rd., Ste. 140, San Antonio, Texas.